MakerCon New York 2014 debuted in the week prior to the 5th Annual World Maker Faire NY ’14. Just a few months ago, Maker Media announced that it had reached the milestone of 100 Maker Faires-worldwide. Today, Dale Dougherty, CEO of Maker Media, personally announced MM will debut 35 new Faires of various sizes in THIS year. This includes another “flagship” event in London in 2015. Why should those in 3DP commerce or common-good care about the Maker Movement? Because—as I discovered in my interviews of Maker Media execs in July—fully one third of Maker activity at World Maker Faire New York 2014 will be driven by 3DP in one form or another. And, the action at MakerCon NY 2014 buttresses the trend to even greater mutual and aligned growth in this natural integration of Makers and 3DP. 3DP is booming. The Maker Movement—as confirmed by Maker Faire ecosystem, global hyper-expansion—is booming. The two vectors are now synergistic. Previously, MM had held a hardware innovation event for Maker “pros”—those building businesses in Maker disciplines—in the official “Weeks” before its two flagship Maker Faires in San Francisco and New York. In addition, Maker Media presented ancillary workshops on building, marketing and managing Makerspaces. In the “Weeks,” MM also held “education days” for teachers interested in Making as a platform for programs—from STEM-based curricula to afterschool to fostering young makers. Now, Maker Media has amalgamated all of these Maker events under a two-day, over-arching event that the company is calling “MakerCon”—short for Maker Movement Conference. MM rolled out the first MakerCon at Maker Faire Bay Area 2014 in May. The company is now presenting its second here in New York City at World Maker Faire Week on 17 and 18 September. Dale Dougherty—as MakerCon ”Master of Ceremonies”—opened the new Maker get-together with these cogent remarks: ”MakerCon is now an umbrella event. In the past [in the week prior to our flagship Faires], we focused on hardware innovation—mostly for the ”pro” Makers. BUT something bigger was happening. That’s why we created MakerCon. [To celebrate the broader Maker Movement drive] to do things that come out of our own heads and share with others. 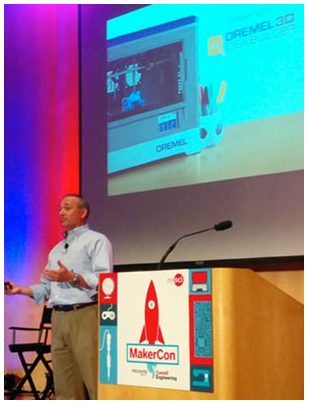 MakerCon is also about civic and education impacts: on and for the community. In the following, Day-One morning sessions, MakerCon quickly proved that it was suddenly the place to be, be seen and be active in rolling out Maker/3DP ideas, relationships and products. John Kavanagh, President of Dremel, rolled out the company’s first foray into 3DP with its innovative “Idea Builder” desktop 3D Printer. According to Dremel, the Idea Builder features easy-to-use functionality, full-featured tools and family and environmental friendliness—all at an aggressive $999 MSRP and availability at selected Home Depot stores in November. Looks like a homerun off the bat. And, the new MakerCon New York was Dremel’s debut venue—reinforcing the alignment of Making and 3DP.